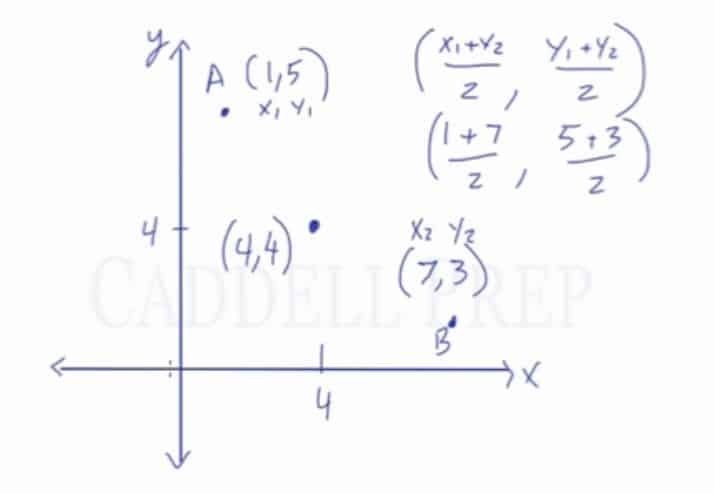 In this video, you will learn the midpoint formula and how to use the midpoint formula to calculate the midpoint of a line segment if the two endpoints are known. Also, you will learn how to calculate the coordinates of an endpoint if the midpoint and the other endpoint is given. The midpoint formula is based on the average of the x-coordinates and the average of the y-coordinates. The formula is used to find the coordinates of the midpoint of a line segment in the x-y plane. In other words, we are simply finding the average of the two x-values and the two y-values. To better understand how to apply the formula, let’s take a look at a couple of midpoint formula problems. Given points and , find the midpoint. Let’s try an example where only one endpoint and the midpoint is given. In this problem we will find the other endpoint. is the midpoint of . The coordinates of are and the coordinates of are . Find the coordinates of . Like the previous example, substitute the x and the y-values. Let’s go over the midpoint formula. We have two points – and in the -system. The midpoint is the point in the middle of these two points. Remember, and is a line segment each with corresponding and coordinates. So the midpoint also has and coordinates. Let’s call the coordinates of as and . Likewise, coordinates are and . The midpoint has the same distance not only between and but also between the two -coordinates and -coordinates. Let’s call the midpoint coordinates as and . Midpoint coordinates are the average of the two coordinates. Let’s find the midpoint of a line segment which has point with coordinates and point with coordinates. Let’s use our formula – average of the two coordinates and the two coordinates. Let’s label the coordinates first so we won’t be confused. This is just a coincidence that we came up with an identical value. But we can come up with any value for the – and -coordinates.